About me | I spent many childhood summers staying in vacation rentals along the beaches of San Diego and some of my best memories are of fun times with friends and family. Since then, I spent many years gaining experience in businesses that added to my experience and gave me a strong foundation to create Bluewater Vacation Homes. My background has enabled me to build an exceptional team of dedicated individuals focused on hospitality and customer service. The underlying founding concept of Bluewater was and is driven by intentionally not being a "Me-Too" vacation rental business, but instead being the "Go-To" vacation rental agency for both the owners of quality vacation homes and for the guests that expect more than what the typical agency provides. How I contribute to the Bluewater experience | My role in the company is to keep the focus on our responsibility to provide clean, comfortable and well-appointed homes where our guests can relax, recharge and create their own lifelong vacation memories. When we do that well, we serve our homeowners' best interests at the same time. Why I love San Diego | What's not to love? Of course you can’t beat the weather, but the options for adventure are endless: Spectacular Coastlines, Amusement Parks, Beaches, Bays, Breweries, Hiking, Museums, Parks, Sailing, Fishing, Surfing, Horse Racing, Padre Games, etc. It's all here! About me | I received my Masters degree in hospitality management at Erasmus University in Rotterdam, Netherlands. Why I love San Diego | What's not to love?! The beach, the food, and the weather! How I contribute to the Bluewater experience | My job is to help new owners have a seamless transition into renting their homes. I communicate what they can expect from our team and make sure that their questions are heard and requests are met by our team. My goal is for every owner to feel that their home is in the best hands in the industry. Why is Bluewater different? | We bring an attention to detail in both the quality of the homes we provide and in our relationships with our guests and owners. About me | I'm a lover of food, family' friends, and San Diego. Being from Northern California, I'm also a big SF Giants fan. Why I love San Diego | It's a big city with a small town feel. The food, the beach, the people and the weather can’t be beat. Also catching a baseball game is much cheaper at Petco than at ATT park. How I contribute to the Bluewater experience | Having been with the company almost since the beginning, I've been able to see every aspect of it. I really enjoy travelling myself, so helping people plan their vacation is just as exciting for me as it is for the guests. Why is Bluewater different? | We really care about our guests and owners. Whether it's an annual trip or a once in a lifetime vacation, we want to make sure every guest has a memorable experience. About me | I studied English at Westmont College and happened into hospitality through a partnership with my dad in renovating and managing a small inn in Southwest Colorado. Why I love San Diego | Modern Times beer, the border town culture, the food. San Diego is a place where anyone is welcome. The no-pretense, laid-back attitude allows anyone to relax here. How I contribute to the Bluewater experience | My primary goal is to make sure that we are who we say we are. I work with all departments to ensure that we communicate well with our guests and owners. I also help our team use the tools that we use effectively. Why is Bluewater different? | We are a motivated team of individuals who bring to the table a myriad of backgrounds. I think our range of experience allows us to provide a superior guest experience through attention to the often neglected details of vacation rentals. About me | I grew up in construction working for the leading architectural and building firm on Cape Cod. As I've grown in my field, I think I have intentionally surrounded myself with quality building practices and exceptional homes, which have formed the standards of excellence that I hold myself to in my work. Why I love San Diego | I love the life that I have created for myself here. And the weather; I can ride my bike any day of the year. How I contribute to the Bluewater experience | I think I bring value to Bluewater by being in the homes we manage on a daily basis. I can confidently say I know our homes inside and out which allows me to contribute to the guest and owner experiences from behind the scenes. If I am doing my job well, guests will never need to contact or hear from me. Why is Bluewater different? | I think Bluewater sets itself apart with our high standards of quality. Whether it be home quality, cleaning, or quality of maintenance, we set the bar high and don’t settle for mediocrity. About me | I’m a huge movie buff and love playing pub trivia. I am a traveler at heart, and happiest out exploring and finding great spots to photograph. Why I love San Diego | San Diego may be a big city, but each neighborhood has so much character, you feel like you’re in a different place altogether. Plus, so many amazing and unique restaurants, it’s impossible to try them all, but I’m working on it! How I contribute to the Bluewater experience | My love of art and architecture influenced my career starting out in Custom Home Construction, and my love of travel led me to Hosting and Vacation Property Management. That experience helps me ensure our Homes are in the best possible condition. I feel privileged to have the opportunity to create an environment for our Guests to make life-long memories with family and friends. Why is Bluewater different? | Across the board, the team at Bluewater puts the Guest Experience as our highest priority. Collectively, we use our talents to take the stress out of travel, so our Guests can enjoy themselves from the moment they walk in the door. About me | I received my degree in Marine Science and I have a deep love of the ocean. Why I love San Diego | I love the beautiful weather, the beach, and the active lifestyle of SD. How I contribute to the Bluewater experience | As a San Diego Native, I love to help people traveling here for their first time make the most out of their trip. Why is Bluewater different? | We care about ensuring each guest leaves with a love for the city and feeling as though they could rely on us to better their stay. About me | I enjoy helping others and pursuing my dreams. Why I love San Diego | Growing up here was a blessing, and I am so thankful for that. San Diego is a very unique place that offers so much to its residents as well as visitors. The climate is amazing! From beaches and mountains, to deserts. I love being active in my daily life. Be it surfing, dirt biking, snowboarding, or jetpacking. Here it is all possible in a variety of different settings. I am excited to share San Diego with any visitors, and do my best to show them why I love it here so much! It is such a great place I hope everyone gets to experience even just a fraction of what it has to offer. How I contribute to the Bluewater experience | I play a part in making sure that all our vacation rentals are up to date and ready for our customers when they arrive. I fix and replace any damaged property in the rentals. I also provide one-on-one support to customers that may have any issues during their stay. My main goal is to insure that our customers have a memorable experience by doing my job to the best of my abilities. Why is Bluewater different? | Bluewater is one of a kind. It’s not just about the property but the overall experience the customer receives while staying with us. We also pay very close attention to all our homes and keep them in the best of order for all our owners. About me | I grew up in Olympia, Washington and moved to San Diego on a whim, I fell in love with it and don’t ever plan to leave! I enjoy spending time at the beach, singing, and doing yoga! Why I love San Diego | I love the sunshine, the food, and living so close to the beach. How I contribute to the Bluewater experience | I help guests find the perfect vacation rental that fits all of their needs so that they can love the home they rent. Why is Bluewater different? | We really care about our guests and their happiness with the home they have rented. We are honest, attentive, and do everything we can to make each and every customer feel at home and taken care of. About me | I am a former steel manufacturer of 7 years as well as a farmhand. Why I love San Diego | The abundance of outdoor activities and hobbies to take up and all the mixed cultures and people from all over the world. How I contribute to the Bluewater experience | I bring a can-do attitude, Southern hospitality, and always strive to further improve my skills in my field of work to benefit our guests and my coworkers. Why is Bluewater different? | Bluewater is unique for the simple fact that we are essentially a family that will treat you as one of our own. About me | I come to this position with 32 years of experience in home maintenance and 11 years of experience in Vacation rentals. Why I love San Diego | Are you kidding? What’s not to love? How I contribute to the Bluewater experience | What I love about my job is my ability to improve our homes on a daily basis. I love interacting with guests, giving recommendations, and helping to make their San Diego stay an unforgettable one. Why is Bluewater different? | Having worked for other companies in the industry, Bluewater is simply the best in San Diego. About me | Being born and raised in San Diego, I can never get enough fun in the sun. Growing up, I was always at the beach or the zoo before swim practice. Loving my hometown has made working in the hospitality industry a natural fit. 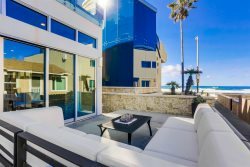 Why I love San Diego | I love San Diego because it is truly unique and offers something different for everyone; there is always something new to discover. Whether that's swimming at one of our many diverse beaches, walking through the coves along the coast, hiking trails in the mountains, or exploring our beautiful deserts; there is something for everyone. How I contribute to the Bluewater experience | I ensure that our guests have the best possible experience in our homes. My contributions are mainly in guest services, as well as operations and accounting. Why is Bluewater different? | Bluewater cares about the quality of our homes as well our guests’ overall experiences. We take pride in our homes and hope that our guests will make lasting memories in them. About me | I am a huge animal lover and spend a lot of time volunteering with animal rescues. Why I love San Diego | It's always sunny and 75. How I contribute to the Bluewater experience | I make sure our homes are perfect before guest check in so they can have a stress-free stay. Why is Bluewater different? | We strive to be the best and we don’t cut corners to make a buck. About me | I hold my B.A. in Psychology and have 7 years of hospitality and customer service experience. I am a passionate people-person who is dedicated to providing high quality hospitality to our guests. On my off time, I enjoy reading, crocheting, playing with my dog, and going to the beach. Why I love San Diego | What's not to love about San Diego? We have an amazing craft beer scene, delicious food, and perfect weather year-round. The culture here is friendly and focused on enjoying the most important things in life. How I contribute to the Bluewater experience | My role in the Bluewater experience is to assist with Quality Assurance and Operations. I help make sure that our homes are in excellent condition and well-stocked with all of the items our guests may need while they enjoy their stays. Why is Bluewater different? | The team here is truly unique. Everyone has a different background, so each team member brings a unique perspective to the Bluewater experience. However, the one thing that everyone has in common is an astounding dedication to high standards.